(AP) LAGOS, Nigeria - A suicide car bomber detonated his explosives Sunday morning on a busy road after apparently turning away from attacking Nigerian churches holding Easter services, killing at least 38 people in a massive blast that rattled a city long at the center of religious, ethnic and political violence in the nation. While no one immediately claimed responsibility for the attack, suspicion immediately fell on a radical Islamist sect blamed for hundreds of killings in the oil-rich nation this year alone. And some fear the attack could further inflame tensions around Kaduna, a region on the dividing line between Nigeria's largely Christian south and Muslim north. 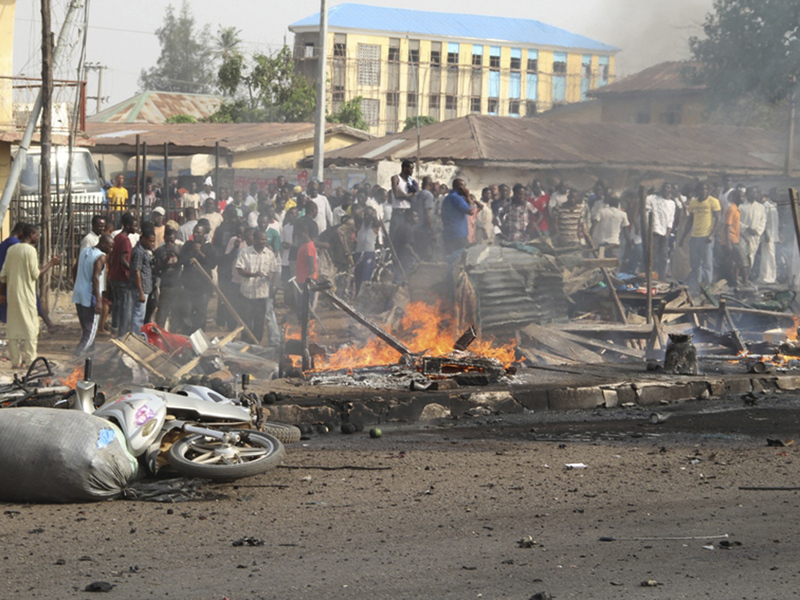 At least 38 people were killed in the blast, said Abubakar Zakari Adamu, a spokesman for the Kaduna state Emergency Management Agency. Others suffered serious injuries and were receiving treatment at local hospitals, Adamu said. A witness, Augustine Vincent, said he was riding a motorcycle just behind the car when it exploded. "God saw our heart and saved us," he said. Churches have been increasingly targeted by violence on holy days in Nigeria, a nation of more than 160 million people of Christians and Muslims. A Christmas Day suicide bombing of a Catholic church in Madalla near Nigeria's capital killed at least 44 people. Police and soldiers quickly cordoned off the blast site, though citizens looked on at the flames and damage. Authorities said they had no immediately suspects in the attack, though a radical Islamist sect known as Boko Haram has claimed similar attacks in the past. Boko Haram, whose name means "Western education is sacrilege" in the Hausa language of Nigeria's north, is waging an increasingly bloody fight with security agencies and the public. More than 380 people have been killed in violence blamed on the sect this year alone, according to an Associated Press count. The near-daily attacks by the sect  and Nigeria's weak central government's inability to thwart them despite public promises  has sparked anger and fear about the group's reach. The United Kingdom and the United States had warned its citizens living in the country that violence was likely over the Easter holiday. Nigeria's government dismissed the warning, with local newspapers quoting presidential spokesman Reuben Abati saying: "Easter will be peaceful for all." Abati did not immediately respond to a request for comment Sunday. In his Easter speech at the Vatican, Pope Benedict XVI mentioned the ongoing violence in Nigeria. Catholic churches have been targeted in previous attacks. "To Nigeria, which in recent times has experienced savage terrorist attacks, may the joy of Easter grant the strength needed to take up anew the building of a society which is peaceful and respectful of the religious freedom of its citizens," he said. Britain's Africa Minister Henry Bellingham condemned the attack, calling it a "horrific act." Meanwhile, authorities said an explosion struck the city of Jos in neighboring Plateau state on Sunday night, another city where religious and ethnic violence has killed hundreds in past years. Yushau Shuaib, a spokesman for the National Emergency Management Agency, said there were some injuries in the blast, but had no other details. State police commissioner Emmanuel Dipo Ayeni said the cause of blast was still being investigated.